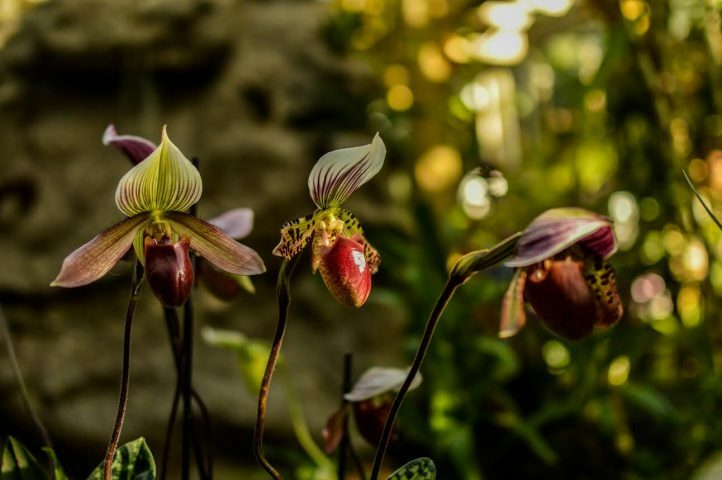 Selby’s orchid show boasts a lush conservatory exhibit with countless species of orchids to sniff and admire. Bulbophyllum phalaenopsis is an orchid that smells like rotting flesh. Unlike most other flowers, whose scent is sweet as to attract moths, bees and wasps, this orchid’s pollinator of choice is the fly. Currently on display at the Marie Selby Botanical Gardens is their annual Orchid Show and, thankfully, Bulbophyllum phalaenopsis is not in bloom. Orchidelirium is the word that described the craze surrounding the Victorians’ discovery of orchids. In the 19th century there was no length too far to retrieve a unique specimen from the wild. One adventurer, who had discovered over 800 specimen, did so despite being robbed 17 times, having to survive a volcano eruption, fighting off a rabid jaguar in the jungle and losing his hand and replacing it with a hook. Today, orchids are still very popular and orchid shows can be found all over of the world. In Sarasota, one can experience an annual orchid show held by Selby, a garden that is known for its orchids year round. 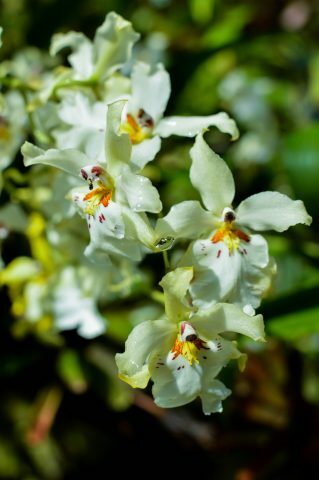 In 2012 alone, Selby staff doing fieldwork in Brazil discovered 24 new species of orchids. Most of Selby’s live orchids for the show can be seen in their conservatory. The exhibit boasts a beautiful, meticulous display of attention to color, texture and architecture. The Tropical Conservatory was transformed for the Orchid Show under the direction of Selby’s designer Angel Lara, Director of Glasshouse Collections and Mike McLaughin, the Senior Director of Horticulture and Site Operations, with the help from guest curator Dr. David Berry, the Assistant Director of Academic Affairs at the John and Mable Ringling Museum of Art. The arduous process involved countless diagrams, sketches and clay models with meticulous attention to measurements and color. Orchids have a highly diverse range of physical appearances. There is a whole subsection of “micro orchids” that can be found all over the world. The second half of the exhibit is in Payne Mansion and pulls from Selby’s three other collections on site: their herbarium, spirit and bibliographic collections. Their herbarium is a collection of 100,000 pressed plant specimens. 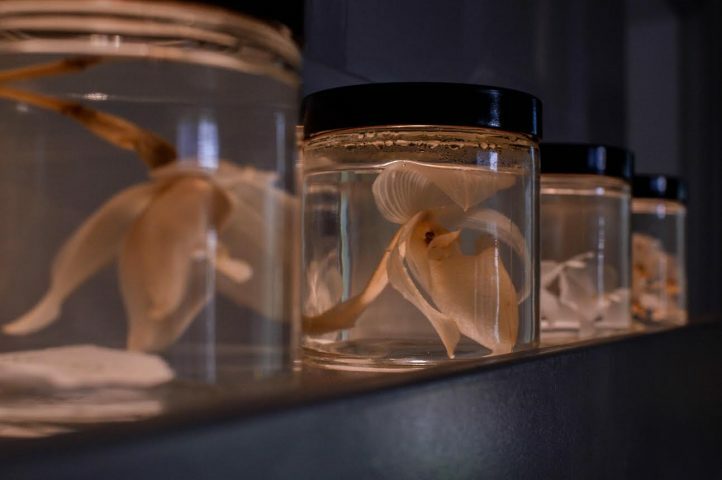 Their spirit collection, which is already primarily orchids, holds 30,000 specimens preserved in spirits and fluids and is the second largest collection of its kind. Their bibliographic collection is composed of books and prints. “The show really encompasses all four collections at Selby,” McLaughin said. With about 27,000 documented species, the orchid family is one of the largest plant families in the world. That doesn’t include hybrids created by people, which amount to an “unfathomable” number of types which is constantly changing as people no longer breed certain hybrids and introduce new ones. The ability to breed outside of their genus allows for a wide array of specimen. Two epiphytic orchids hold a water droplet in between their petals. This year’s theme, “Earth, Air, Fire, Water,” focuses on the immense diversity of the orchid family. They have the ability to specialize to a large range of habitats. 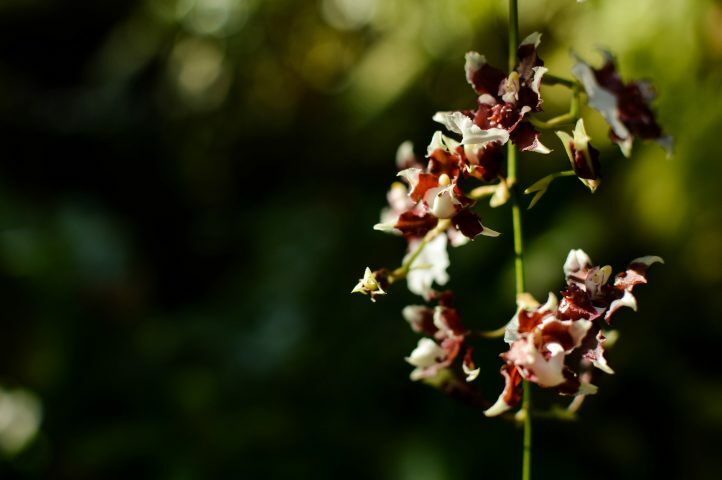 The orchid family is made up of 70 percent epiphytes. These plants live–as parasites do–on other plants. Unlike parasites, they do not rely on the nutrients of their hosts, but instead garner nutrients from the air. Most of the world’s vanilla comes from an orchid, the Vanilla planifolia, which can be epiphytic or terrestrial. It has only one known natural pollinator found in Mexico, the Melipona bee. For years, horticulturists were baffled by the orchid’s inability to produce vanilla outside of its natural habitat. The plant would grow and bloom, but efforts were fruitless. Three “Lady’s Slipper” Orchids. They are native to Europe and parts of North America. The Vanilla vine takes three years to grow before it is able to flower. The flowering period is a two-month window when timing is everything. Each flower blooms for only 24 hours. Pollinators have even less time than that to achieve their goal as Vanilla planifolia must be pollinated within 8-12 hours of flowering. If this transference of pollen from one side of the plant to the other does not happen in time, the flower will quickly wilt and die having never produced a vanilla bean. As a result, commercial production of Vanilla is pollinated by hand. “The pollination system is really specific and puts the orchids at high risk when their ecosystem is disturbed,” McLaughin said. The Selby Gardens has also been involved in the discovery and preservation of a rare, endangered orchid: Epidendrum Ilense. It was discovered in 1976 by Dr. Calaway Dodson in Ecuador and brought back to Selby gardens to be studied. When Dr. Dodson returned to the site for a second time the forest had been cleared away, destroying the flower’s natural habitat. Selby has a large collection of orchids preserved in spirits. Orchids have the rare ability to breed outside of their genus, allowing for flexibility and creativity amongst hybrids. Epidendrum Ilense was then propagated and distributed out of Selby Gardens to insure it remained in existence and is now even available in trade. 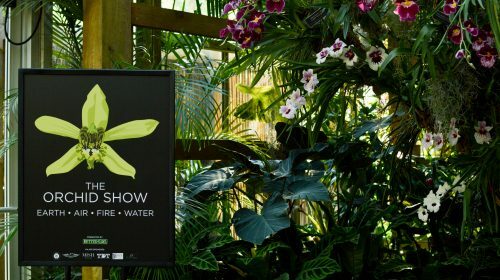 The Orchid show is on display until Nov. 22. Aside from the exhibitions, the show boasts lectures, discussions, classes and events surrounding the show. On Nov. 15 from 12-1 p.m., one can learn about the orchid craze in Victorian Britain from Dr. Berry. Classes include learning how to garden orchids and photograph them. Information from this article was collected from Smithsonian.com, the Marie Selby Botanical Gardens website, the American Orchid Society and University of Wisconsin’s Bioweb.